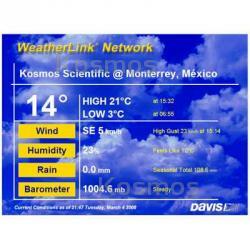 WeatherLinkIP™, Kosmos Scientific de México, S.A. de C.V.
WeatherLinkIP for Vantage Pro®, Vantage Pro2, or Weather Envoy. * Automatically upload data to third-party weather sites including CWOP, the GLOBE Program. * Get e-mail alerts for current weather or alarm conditions. * Download the data to your PC for all the powerful charting, graphing, and analysis as our standard WeatherLink. With Extra User License Kits, you can even download the data independently to multiple PCsideal for schools, agriculture, scientific fieldwork, and remote locations. Get more details on Weatherlink.com and check the FAQ's on WeatherLinkIP. WeatherLinkIP is "plug-and-play," when used with Weatherlink.com. Simple configuration steps are required to upload to third-party weather sites or set e-mail alert conditions. Includes software on CD, data logger, and 5 (1.5 M) cable to connect the data logger to your broadband router. Choose a logging interval of 1, 5, 10, 15, 30, 60, or 120 minutes. You may see Kosmos Scientific station online at http://www.weatherlink.com/user/kosmos/index.php?.